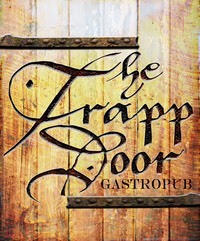 Welcome to The Trapp Door Gastropub! A warm friendly atmosphere awaits. Your experience at The Trapp Door starts with a huge Craft Microbrewery Beer Selection of 6 Unique Drafts, 3 Cask Ales, 170 plus Bottle Beers and the best in Seasonal Fresh Food. A special place to relax, unwind, and catch up with friends. At The Trapp Door we put a strong emphasis on local farm ingredients and quality beer. Our knowledgable staff can guide you through your dining experience with beer pairings and recommendations.